Item # 316276 Stash Points: 3,295 (?) This is the number of points you get in The Zumiez Stash for purchasing this item. Stash points are redeemable for exclusive rewards only available to Zumiez Stash members. To redeem your points check out the rewards catalog on thestash.zumiez.com. 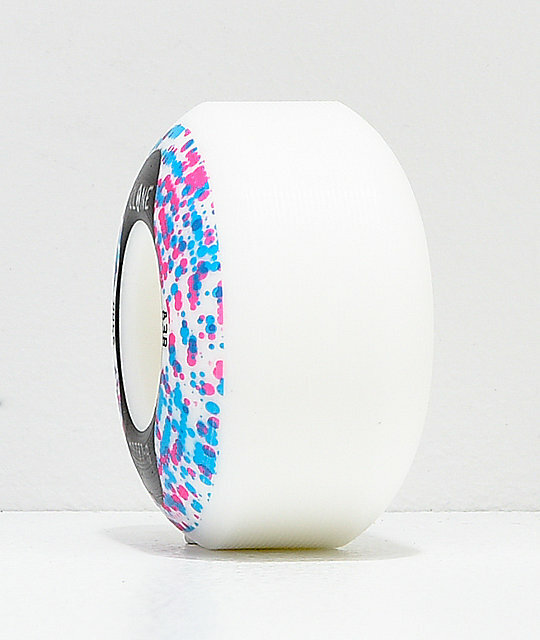 Kiss flat spots goodbye with a set of Clone B Cells 54mm 83b Skateboard Wheels. These extremely hard and durable wheels come in at a 83b durometer rating for a nearly flat spot proof ride. 54mm in size, these wheels offer an ideal mid-range of carrying speed and acceleration for a smooth ride from the bowl to the plaza section. B Cells 54mm 83b Skateboard Wheels from Clone Wheels. Set of 4 skateboard wheels included. Blue, pink and white paint splatter graphic. Super high rebound urethane construction. Durable, flat spot resistant formula.